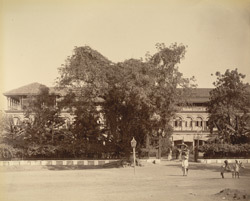 Photograph of the Public Offices at Baroda, Gujarat from the Curzon Collection, taken by an unknown photographer during the 1890s. The offices were contained within the Juni Kothi or old fort, an ancient part of Baroda. They comprised the Secretariat, the Record Office, which also accommodated the Military and Police Offices, and the State Library. The offices date from the mid-19th century onward. The Residency Office was formerly in the fort from 1802-1832.